Last weekend Charming Suitor and I woke up very early on Saturday morning, (well, early for ME, fairly normal for most people) and headed out to the Evanston Farmer’s Market. I had never been to this one, but it is CS's preferred market, and he was eager to check out the early summer wares. I was just glad to have a chaperone. Farmer’s Markets are very dangerous places for me, since I almost always overbuy, everything looks so amazing, and then I have buckets of beautiful veggies and fruits going all melty in my fridge. Which is why it is good to go with both a specific plan in mind, and a lovely gent who will look at you with one eyebrow raised when you seem to be headed towards disaster. We decided we were simply there to suss out some stuff for dinner that night. I already had a pair of pink and succulent veal chops, so we needed some salad and sides. First things we found were baby beets and beautiful lettuces, so salad was easy. Baby beets are a new love of mine; I have previously not really enjoyed beets. I spent a long time believing that beets sort of taste like sweet mud. I only ever really liked them fried into chips . The pickled ones simply make me want to gack. But I adore all other root veggies, so recently I have been tasting more, and I have discovered that while I still don't like the huge beethemoths, I find the little ones just delicious! And since they are in season, I have been eating them everywhere. So I thought it was time to make some myself. I roasted them simply for an hour in a foil packet at 325 with a little slick of oil, let them cool till I could handle them, slid off the skins, and tossed with olive oil, salt and pepper and chopped chives. Piled on top of lettuce dressed with olive oil and salt, and sprinkled with salty feta, they make a wonderful summer salad. CS found his favorite little fingerlings, Rose Finn Apple, with a thin skin and pinkish hue, which he does in a packet on the grill alongside the meat. Tiny English peas, which I love to simply steam. Since prep was happening at my house, but actual cooking was happening at Charming Suitor's house, I was particularly happy to have recently received this set of containers from Snapware . They are tempered glass, and the lids snap down firmly on all sides with a satisfying click, making it unfailably clear that the things are really closed. This is essential if perhaps you have ever arrived somewhere to discover that the baked bean juice has leaked all over the bag in which you are transporting it, and possibly the car seat it is sitting upon, due entirely to user-error related seal failure. Hypothetically. And three colors of raspberries. One of my all time most favorite fruits. They are also a wee bit dangerous, because these babies often go from perfect to moldy mush in what seems to be around three hours. But who could resist them? And how could we choose? Lucky for me, in the summer, nothing is better than a light and fluffy mousse for dessert. You can use anything bruised or about to turn, since they have the deepest flavor. My version is half whipped egg whites, so it isn’t overly rich or terribly bad for you. The perfect thing when you have an abundance of riches. In the meantime, nothing says prep like coming back from the farmer’s market. Between washing all the beets and greens and potatoes and berries, shelling the peas, and making the mousse, not to mention the dishwashing, there were nearly 3 hours of standing in the kitchen. Made quite unexpectedly pleasant (or at the very least, significantly less unpleasant) thanks to my fabulous new Gelpro kitchen mat . I’ve seen these things for years, and wondered why bother? I don’t cook in dumb shoes, and my kitchen floor isn’t made of stone. Yes, I do often finish a major cooking day with lower back pain and sore feet, but I always assumed that had more to do with my personal abundance of self, and not with the surface upon which I was standing. So with comfy supportive shoes, why invest in a squishy kitchen mat? Gelpro sent me their basic 20 x 36 inch mat , in a simple basketweave print, and I gamely plunked it down in front of my small prep counter. Sweet fancy Moses this thing is squishtacular! It is squishtastic! It made me want to do a little bouncy dance while I cooked. I loved it so much, that I kept moving it around…sliding it in front of the sink for washing veggies and cleaning dishes, back over to the prep counter for slicing and dicing and whipping and folding. Scootch it on over to the stove for stirring and mixing, then back in its original place. It has become very clear that I am going to need to invest in the longer version to go across the whole prep/stove area, and move this smaller one in front of the sink, so that I don’t have to keep moving this one all over creation. I’m also tempted to get a really little one for the bathroom sink, lord knows that hair and makeup could certainly be a little comfier! Provided of course that CS doesn’t steal it and take it to his house, because don’t think it didn’t get a guttural “Oh, my!” from him when he alit upon it shortly after it arrived. I have a feeling I’m going to have to frisk him when he leaves, just to be sure he has not absconded with it. Because as much as I love my Charming Suitor, that Gelpro is MINE! Seriously, instant difference in my cooking experience. And which is better, I got through with all my kitchen stuff for the whole day and my feet didn’t hurt and my lower back was absolutely untweaked! I went to check out the Gelpro website, and they have ten different patterns, eleven different sizes, and over 50 colors, so no worries about matching kitchen decor. Trust me, your feet and back will thank you! I can’t wait for my next dinner party, I have a feeling it is going to make a world of difference. But amazing squisherrific mat or no, make this mousse. Check out that COLOR! The pic doesn't really do it justice, I'm still working on that whole food-styling thing for you guys. The recipe looks more complicated than it really is in practice, and the flavor is just wonderful. Plus it serves 8-10 very easily, so you can invite the neighbors over for dessert! This recipe is for the version I made last weekend, but you can really use any mix of berries or stone fruits. Serve with fresh fruit, and if you want to take it up a notch, a spoonful of mascarpone cheese, or crème fraîche. 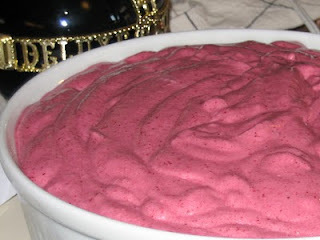 Puree the raspberries in a blender or with an immersion blender, then strain to remove seeds and set aside. This is really important, because especially the black raspberries have a LOT of seeds, and those suckers will break up the pure unctuous smoothiosity of your lovely mousse. Sprinkle the gelatin into 1/4 cup of cool water and set aside for 3 minutes. Pour 1/4 cup water, 1/2 cup sugar and the corn syrup into a small, heavy saucepan and place over medium-high heat. Insert a candy thermometer. While the sugar mixture is heating, place the egg whites into the bowl of a mixer and whip on high until they form soft peaks. When the sugar has reached 250 degrees, pour it down the sides of the bowl (not directly onto the beaters) into the egg whites while continuing to whip. Toss in the gelatin mixture and vanilla and a pinch of salt and continue to whip until the outside of the bowl is warm, but not hot, about 5 minutes, and the meringue is stiff and glossy. Pour the cream into a large mixing bowl and whip until it forms soft peaks. Fold half of the raspberry puree into the whipped cream and the other half into the meringue, being careful not to deflate either mixture. Fold the meringue and whipped cream together until combined. You can put this into 10-12 small ramekins for individual servings, but I just pour the whole batch into one large bowl. Place the mousse in the refrigerator to set for at least 3 hours. To serve, drizzle each plate with raspberry sauce, and spoon a generous serving of mousse in the center of each plate and serve with a dollop of mascarpone or crème fraîche on the side. To make a great sauce, combine ½ c sugar and ½ cup water in a small nonreactive, heavy saucepan, and bring to a boil over medium heat. Add 1 1/3 cups of raspberries and return to a boil without stirring. Transfer to a small bowl and allow to cool completely. Add 2 T Chambord or Kirsch. Cover and refrigerate. Oh my gosh that looks amazing! I love making chocolate mousse, but I've never had raspberry before.